The original name of this dish was Chickpea Tikka Masala. As a Western aficianado of Indian cuisine I have long been famliar with the Chicken Tikka Masala that is offered on just about every Indian restaurant menu in the United States and I have enjoyed it when I have had it, but as I have gotten more familiar with Indian food and more adventurous in ordering new and different items from the menu it has fallen by the wayside. But it looked like it might have the base for a really tasty dish so I marked it for future use. I came across it in my big unplanned recipe reorganization a couple of weeks ago and decided to make it one of my first New-Recipe-a-Week-Project dishes, mainly because I already had most of the ingredients on hand, and also because I am so fond of Chicken Tikka Masala. The one ingredient that I did not have was garam masala, which is the main component of this dish and what makes it Indian. I usually make my own, but to be honest these days I have found it easier to just add the spices individually. My garam masala always seems to go stale on me before I can use it all, whereas the spices on their own stay fresh longer. Perhaps it is because I grind them in small quantities and use them more frequently than I think to use the garam masala. And because it was a Vegetarian Times recipe I was pretty sure it would need some spice help anyway, so I put together my own spices and was lucky enough to hit it out of the park, if I do say so myself. I remember reading somewhere that tikka means chunks or pieces, which makes sense because all of the Chicken Tikka Masala that I have seen has cut up chicken pieces in it. 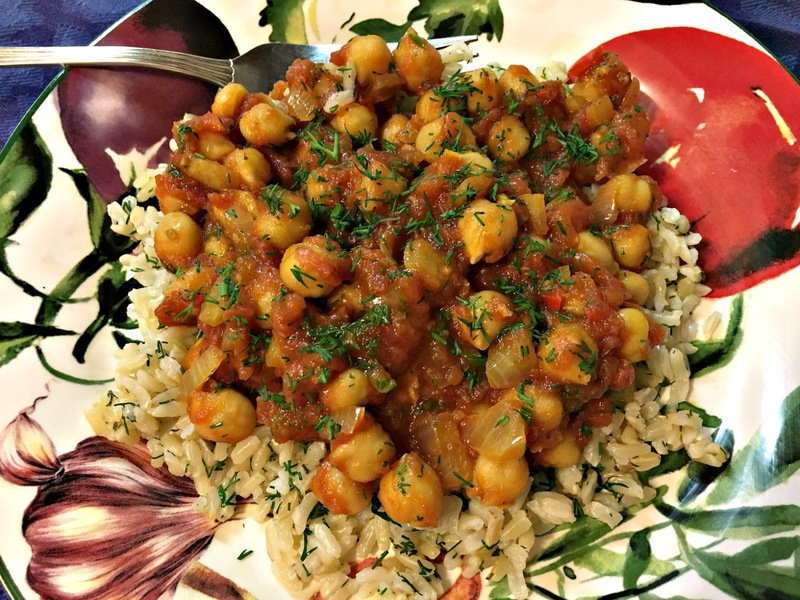 But the chickpea is whole, and since I made enough changes to the original recipe to make it my own anyway I decided to rename it as simply Chickpea Masala. If you do not have all of the individual spices on hand, then you can certainly use an equivalent amount of garam masala or even sweet curry powder to the individual spices, adjusting to your own taste, of course. The original recipe calls for cilantro and not dill, but dill was what I had on hand so dill was what I used. I love cilantro, but every once in a while it is nice to highlight with a different herbal profile, and dill worked beautifully in this dish. And it matched perfectly with my dill rice. Heat the oil in a large skillet over medium heat. Add the onion and saute until softened, for a minute or two then add the ginger and serrano pepper and cook until the onions have softened, about 5 minutes more. Make a space in the skillet and add the tomato paste, stirring it around for about 30 seconds and slowly incorporating it into the onioins. Add the spices and cook for another minute until they are fragrant. Stir in the chickpeas and tomatoes. Bring the mixture to a boil then reduce the heat to medium low. Simmer for 15 minutes, or until the tomato mixture has reached the desired thickness. Remove from the heat and stir in the dill. Serve over dill rice.